This is a demo of Math Olympiad 3. Your next practice questions in a specific program will be specially tailored for you as the system learns from your previous practices! Smith has 1 more brothers than sisters. How many more brothers than sisters does his sister Mary have? David is the shortest. Eric is taller than Richard and Richard is shorter than Ed. Can you make the following conclusion that "Eric is taller than Ed"? Jessica has 19 cards, and Kevin has 23 cards. How many cards does Kevin need to give Jessica so that they have the same number of cards? Emily is 18 years old, and Larry is 8 years younger than Emily. How old will Larry be when Emily is 39 years old? Figure out how the first two sets of numbers are related and then select the number from the choices to fill the question mark so that the third set of numbers have the same relationship as the first two sets. Find all two-digit number(s) that equals 6 times the product of its digits. Separate each number with a comma if needed. There is a string of beads. Counting by 8s, 3 more beads are needed; Counting by 9s, 4 more beads are needed. At least, how many beads are there in total? Note that the total number of beads is more than 8. If there are 5 Thursdays within June in a year, which of the following can not be the last day of the month? How many squares can you count from the figure below? (Note that each cell in the 2x3 grid is a square). By click the below Submit button, answers are finalized. 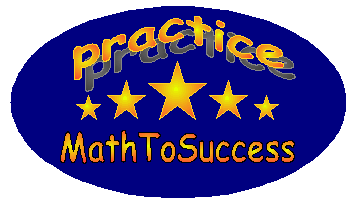 Copyright© 2007-2019 MathToSuccess Systems, All Rights Reserved.